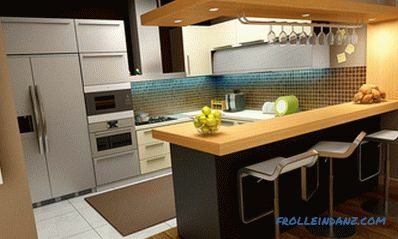 A modern-style kitchen has always been very popular among interior designers. Perhaps the reason for this lies in the fact that this style is compatible with almost anything. This allows the homeowner, as such a desire appears, to easily redo and improve the surrounding space. Modern style is not only attractive, but also functional. Modern style allows you to create inspiring interiors, and the kitchen should not be an exception. Modern kitchen is dynamic, has clear, sharp lines, characterized by the use of smart ideas for the rational storage of things and create a pleasant appearance. Every corner of the cooking area should be well lit with natural light, if possible. Ideally, the kitchen should be separated from the dining room and living room (so that cooking smells do not "drift" throughout the house), but remain easily accessible. Those who are preparing to seriously change the look of their kitchen, on their own or using the help of professional designers, have many questions. And we will answer today some of them, the most common ones. There is no reason why modern-style kitchen design should have cost more than interiors in other styles. The beauty of modern interior lies in its functionality. You do not need to spend money on unnecessary decorations, that is, theoretically, the design of the kitchen should cost you even less. Regardless of the style you choose, however, kitchen design is a major investment, so be careful when developing your own projects, ask for help from professionals. Light is crucial in kitchen design, no matter what style it is designed After all, when cooking, it is very important to see everything clearly. And in this case we are talking not only about lamps: think about the placement of windows, the color of walls and cabinets. An important aspect is the availability of free space. For the whole family to get together at the dinner table, the kitchen should not be small. And if small children run around, then safety should be a serious criterion. 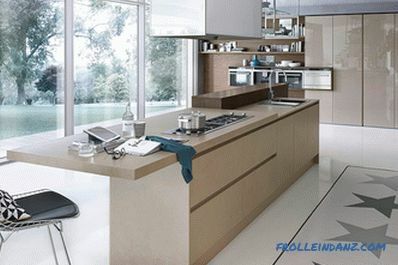 A good modern kitchen should be highly functional, and its beauty stems from this quality. It depends on your taste! For some people, an island table will become an unnecessary expense and will only inconvenience, limiting movement around the kitchen. For others, having an extra place to eat food is a vital aspect that turns the kitchen from simply cooking space into a place to socialize with your loved ones. If your dining room is far enough away from the kitchen, then an island table can be an ideal addition. However, if you have a small kitchen, then trying to squeeze an island table there can spoil the harmony of the design, which should be avoided at all costs. The countertop serves as a worktop, and it must be extremely functional. There are many materials for the manufacture of tabletops, combining this functionality with beauty: polished granite, stainless steel, wood, etc. In general, an ideal tabletop should be easy to clean, be durable and fit well into the overall design. Do not buy an exotic tabletop, simply because it looks great in itself. How will it look in your interior? One inappropriate item may upset the overall balance. Almost any homeowner can do a simple redecorating the kitchen to transform the old space, make it look new . 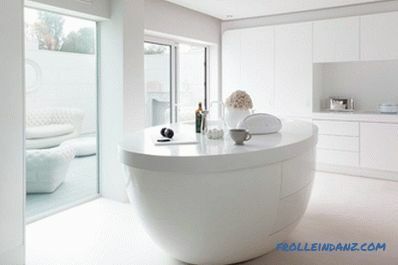 Kitchen design is an ever-changing sphere with an almost endless variety of different styles. 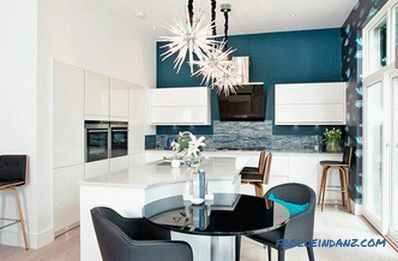 You can give preference to a pure white interior that echoes the science fiction spaces, or create a modern industrial-style kitchen with heavy use of metal. With the help of brickwork, you can achieve elegance and add some rustic charm, and the correct selection of colors will help create a space that pulsates with energy and charm. The main thing is to design the space correctly, and the decorative elements will become those small strokes that are necessary to complete the conceived picture. For those who want to make their kitchen unlike any other, we offer several modern design ideas.If you make creativity the main ally of yours, then your renewed kitchen will undoubtedly start to delight your household and neighbors. The natural and natural shades used in the design of this kitchen create a good balance of male and female accents, which means that the interior will appeal to any member of the family. The pleasant texture of the stone worktops and kitchen apron looks great against the smooth surfaces of the cabinets. The warm shade of the working surface of the island table, used both for cooking and for receiving guests, gives the space a special depth. The effect of the steel surfaces of household appliances is enhanced by translucent gold pendant lights. Finally, the additionally highlighted smooth marble pattern of the kitchen apron behind the stove brings a new texture and a new color combination to the interior. This classic industrial interior with elements of modern design "saves" color, but not style. 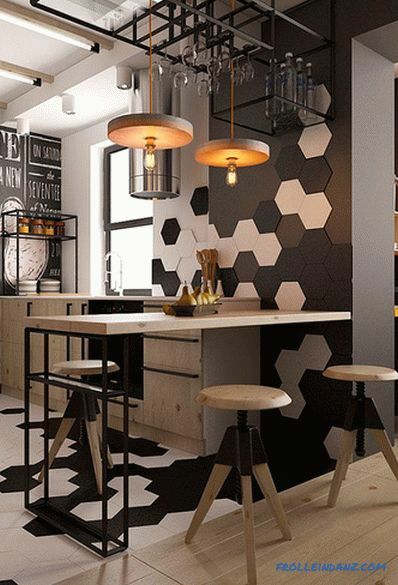 The black-and-white pattern in the form of honeycombs smoothly flows from the floor to the wall, thus easily connecting the parts of the space together. The natural purity and beauty of unpainted wood used for the manufacture of stools, countertops, kitchen cabinets and hanging lamps, gives a little rest from this slightly gloomy black and white picture. Having space for storing glassware over a peninsular table allows you to significantly unload kitchen cabinets. The lack of variety of colors in this interior is offset by its design features. Against the clean, smooth white surfaces of this interior, dark amber butterflies in the shape of butterflies look great. 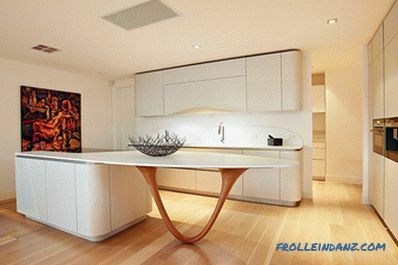 Due to its polygonal shape, the modern kitchen island of Corian is unique - it does not look like its counterparts with their monotonous right angles. The unusual material of the kitchen apron makes it look like a window, in fact it is a tempered glass painted in dark black. Such an apron “window” visually expands the space, otherwise the room would seem too narrow. The built-in storage spaces in the island table as well as in the cabinets located near the back wall, make it possible to hide everything that is unnecessary at the moment. 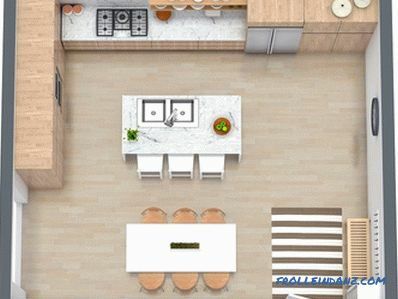 At first glance at this room it is difficult to guess the full kitchen in it, because all household appliances are skillfully hidden from view. Thanks to the unusual design of the island table and materials that are not usually used in kitchen design, guests may feel that they are sitting in a bar. Another feature of this kitchen is an exquisite set of chrome-plated glass-shaped lamps above the table, filling the room with warmth. The dark mirror tile on the kitchen apron deepens the back wall, and the blue chairs add a soft feel. One glance at this cuisine brings to mind the soft taste of chocolate “marble” cake. The sweet chocolate brown color of modern kitchen cabinets contrasts sharply with the smooth glazed texture of the marble worktops and apron. Bar stools on cast-iron supports with seat mats made of material, with their texture and color resembling a cork, add a touch of coarse rawness. Thin silver-glass pendant lamps, lined up, make the room visually less wide. Large windows provide the kitchen with the ideal amount of light to emphasize the openness of the space. At first glance, this project seems to be incomplete: for many, this interior will surely evoke memories of a school workshop and labor lessons. But the raw tree, undoubtedly, is a highlight of bright space. 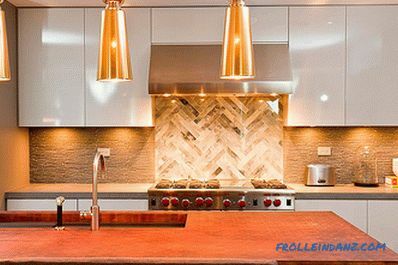 A kitchen apron with a chevron pattern defines the color scheme of the interior, deepens the space, emphasizes the natural color of the wood in the kitchen cabinets. The bluish-gray apron tile blends incredibly well with light yellow and cream. Focusing light on individual cabinets and the front of the island kitchen table completes the overall picture. This design proves that the knots and fibrous structure of wood are enough to transform the space. Contrast is what unites this space. Bright spots of color flashed on the black and gray scene. All surfaces are smooth and shiny, either due to the nature of their material, or as a result of applying a thick layer of vitreous varnish. Perfect color choices allowed the designer to create a space that would otherwise have been lost in the dark. The use of bright, contrasting colors on a plain and slightly dull background is the key to creating a memorable space.Transparent glass pendant lights provide good lighting, but do not distract from the intended focus - colored blocks. Cleverly placed white accessories (in this case, a tea set) add a bit of dimension to the foreground in order to visually separate the island table from the back wall. 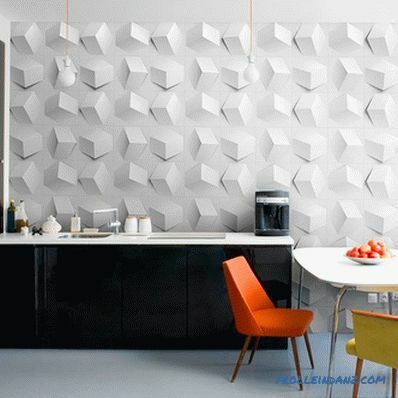 In the design of a modern kitchen sometimes use unusual materials. Many designers in recent years have begun to use concrete for the manufacture of textural countertops. However, very few people had the idea to include it in the structure of the island kitchen table. Combining the construction of concrete, stainless steel and wood made it an independent work of art. The tabletop is a surface that is ideal for cutting meat and cutting vegetables; it is not surprising that it is here that there is a place for convenient storage of knives. Modern kitchen cabinets on the back wall, providing rich storage, do not distract from the focus on the magnificent island table. The partially glazed roof is an ideal source of lighting during the daytime, and in the evening a giant silver sculptural chandelier will be included, which is another work of art that brings a touch of modern style to the kitchen interior. At first glance, this space may seem like some kind of futuristic diner. Nevertheless, this is a vivid example of the fact that modern kitchen ideas can be based on both classical and revolutionary design styles. Bright white and purple are undoubtedly the ruling colors in this space. A purple focus on inserting a dinner island table adds a pleasant tide to the color of the area, which might otherwise have blurred. Amber pendant lights add a third dimension to a two-color color scheme. Such a triad of shades can only be described as striking. 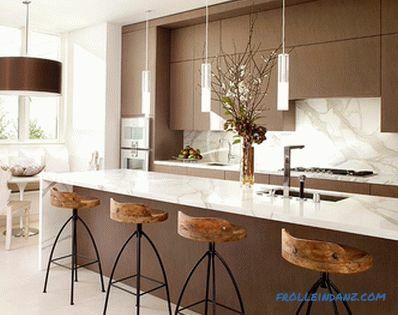 This kitchen with its deep tones proves that the color of espresso coffee has not yet emerged from the interior fashion. The timeless combination of stainless steel and shades of brown is well suited to transform the back wall with its beautiful marble apron and table top. In order to create a bright focus in the interior, the designer decided to light the space in two ways that were not quite common: here there is also a hanging chandelier consisting of hundreds of oblong transparent glass balls, and a lighted bar counter top made of frosted glass. Openness of a space is often its greatest value. To make this room look even bigger, the designer used several reflective surfaces. Mirrors are located above the tabletop instead of the traditional apron, and behind the open shelves, which not only serve as storage space, but also perform a decorative function. 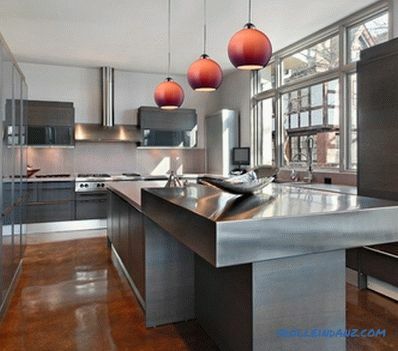 Thanks to the reflective surfaces it seems that the kitchen extends beyond its walls. In addition, mirrors increase the brightness of space by repeatedly reflecting the light coming from various sources. The white color of the cabinets along the walls makes the room seem even cleaner than it really is. However, the true attraction of this cuisine is an unusual island table. The curved ends of polished steel continue to reflect the reflective theme of space, and the dark frontal surface of balsa wood adds good contrast to the snow-white cabinets. 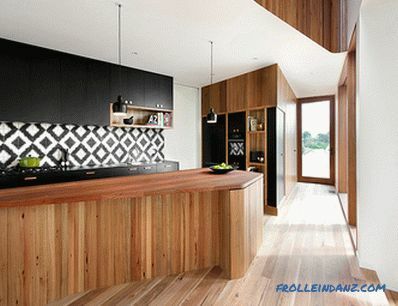 What is the main feature of this kitchen becomes clear when you first look at it. The bright illumination of the marble frontal surface of the island table creates the right mood for a relaxing pastime. The back wall with its gorgeous dark-colored cabinets provides the kitchen with enough storage space. The matte metal surfaces of kitchen appliances and the soft gray color of the apron do not distract attention from the marble island table, but at the same time emphasize the overall elegance of the design. The large dark stone worktop provides a large area for cooking or gathering with friends. An excellent addition to the overall picture are black pendant lamps in industrial style and black leather bar stools. 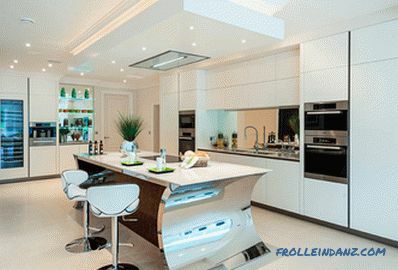 Modern kitchen interiors are often the result of the fusion of elegant space with fancy elements. This design is no exception. The unity of white walls, cabinets and island table is broken by a turquoise accent wall. The kitchen apron where stones of blue, white and silver colors are mixed reminds ocean waves on the beach. The semi-circular cutout on the island table creates an ideal place for two who decide to have breakfast in such a romantic setting.Lamps in the form of sea urchins not only provide space with a soft light, but also help to make a room with too high ceilings more comfortable. Another interesting addition to the design is wallpaper with the image of fish on the side wall. 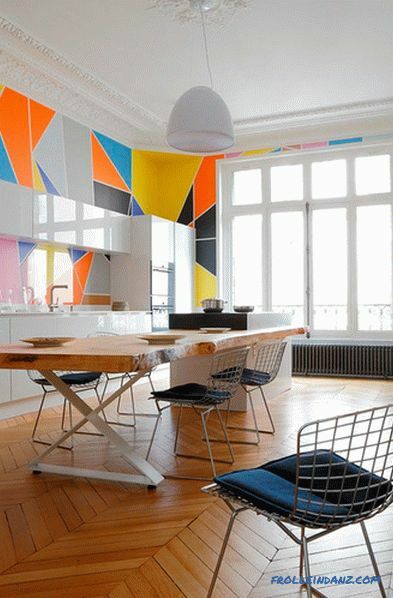 This wall adds an element of quirkiness to a room that otherwise would just be another modern interior. The brilliant emerald surfaces of the cabinets and island table in this kitchen evoke a slight feeling of nostalgia for times gone by. This almost translucent blue color resembles the shade used for dyeing household kitchen appliances and accessories in the 1940s. There are no sharp corners in this space. The rounded edges evoke memories of cars and aircraft of that decade. 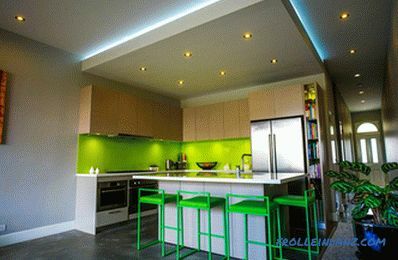 LED lighting throughout the room provides a soft, neon-like light. This interior confirms that the basic design elements of the past days did not disappear completely, but were transformed into new elements used by modern designers. 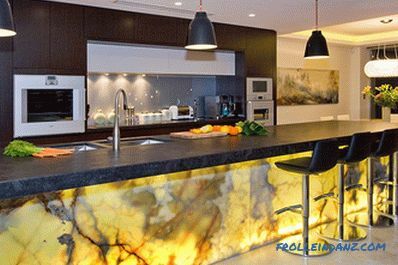 The bright energy of yellow color makes its way through the darkness of the dark color palette of this kitchen. 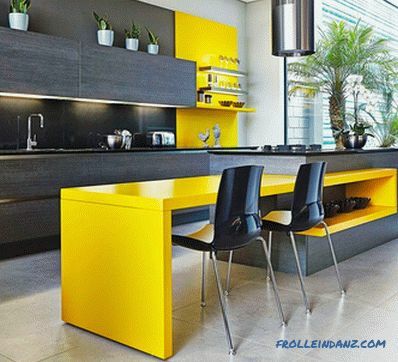 Almost the entire far wall is occupied by cabinets with black veneer and black countertops, but this black is broken by inserting an accent bright yellow color. In the dining area of ​​the island table there is the same blot of yellow. Both yellow inserts are painted with gloss paint, which further increases the energy level. Beautiful marbled cream-colored floor tiles create a nice contrast to dark cabinets and bright yellow elements. This design is a great example of using two contrasting levels of intensity in a single space. Like many other modern kitchens, this space makes the island table the center of attention. A cream-colored storage cabinet is skillfully built into the side wall, which saves space while maintaining functionality. The same cream color painted furniture with rounded shapes at the back wall. The designer deliberately did not use a color scheme that could distract from the main attraction of the room - the legs of the island table of a fancy shape. Of course, it would be possible to rest the tabletop of the island table on a more traditional cylindrical or multi-faceted leg, but the designer decided to use a magnificent piece of wood in the form of an arc as a support. The cedar shade of this beautiful wooden detail is perfectly combined with the light wood of the floor covering. Efficient use of space is one of the fundamental principles of modern design. This almost professional kitchen demonstrates how to preserve the full functionality of the space without compromising the quality of the design. Skillful use of space above and to the side of the daily work area allows you to keep all the necessary tools at hand. The glass doors of these storage spaces provide contrast with low-level wall cabinets. A ladder, like those used in libraries, allows a chef to easily access everything he needs. Stainless steel appliances occupy a significant part of this kitchen, but they do not seem to be a foreign element here, since they form a single whole with the countertops of the same material. A bright red apron brings a pleasant splash of color into the interior, which otherwise might seem somewhat sterile, and the vintage plates hanging on this apron add emotionality to the room. The interior of this kitchen is a clear demonstration of the fact that gray does not seem monotonous and boring with the right approach to design. The bluish-gray tones "spread out" here everywhere - from the cabinets to the walls and the floor. 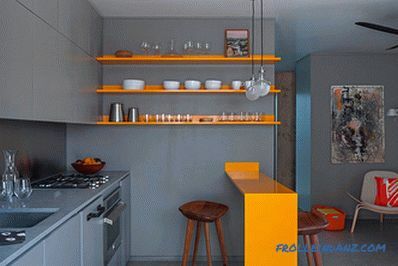 Bright orange wall shelves and a miniature bar counter added a bit of vitality to this interior. The apron from stainless steel is perfectly combined with a gray table-top. The image is completed with two semi-matt lamp-lamps, which serve as a light source in the dining area. In this kitchen, white lacquered upper cabinets and dark matt bottom help draw attention to the lower part of the space, and therefore to the unique island table . The glossy legs and table top of the island table is a frame for a magnificent screen located on the front side, made using laser cutting. The screen color matches the color of the lower cabinets. In order not to distract attention from the island table, the designer, using the built-in lighting, heightened the illumination of this zone.A mirror apron also helps to reflect natural light to make the space even brighter. 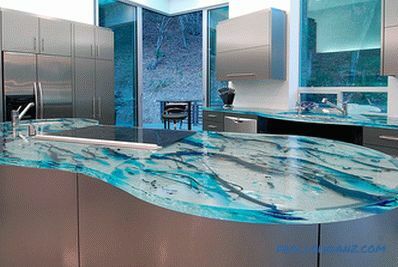 The three-dimensional technique used in this kitchen combines various materials together to create a complex effect. 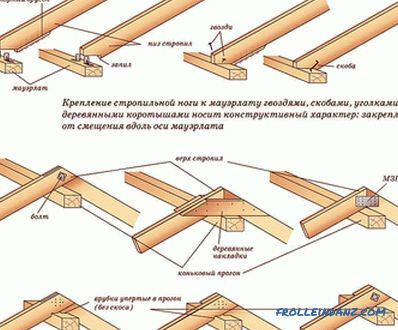 This technique starts from the ceiling, where various rounded shapes descend lower and lower as their radius decreases. 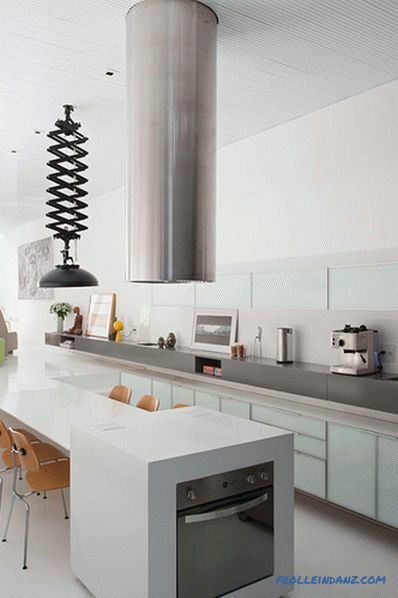 This spiral ends at the lowest point with a stainless steel hood and similar pendant lights. Another set of measurements rises up from the island table - first a marble tabletop, then a pretty wooden piece that serves as a seating area, and finally, the topmost element, less functional, but still necessary to create a complete image. The designer used the technique of layering and in the color palette. Different shades of purple overlap each other on the back wall and cabinets. 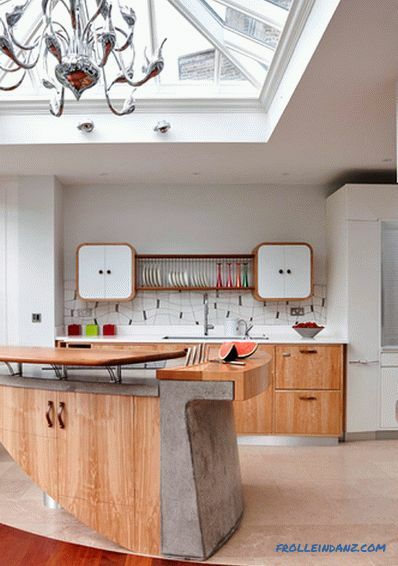 This kitchen interior in modern style clearly demonstrates that the concept of layering is not just for clothes. The minimalism of this interior ensures that the creative island table will not go unnoticed. Due to the whiteness of the walls, cabinets and floors, this table seems simply gigantic. The shape of the island (did you notice its resemblance to a tea cup?) 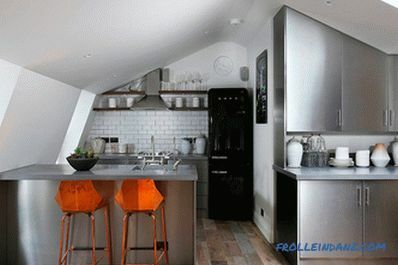 Is truly unique, but thanks to the inclusion of storage space and a sink, it has not lost its functionality. Minimalistic design is transferred to the patio next to the house, which means that large windows will not allow any elements that do not correspond to the concept of minimalism to “seep” inside. 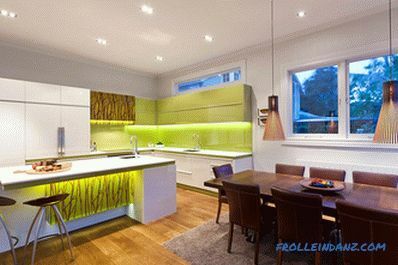 The bright lime green color used in the interior of this kitchen attracts attention and makes the space visually larger. 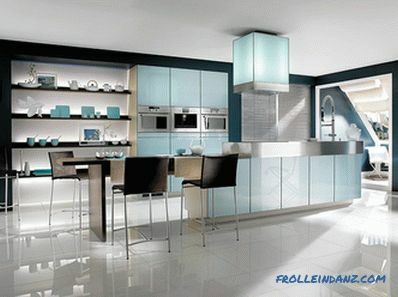 Wooden facades of wall cabinets create a nice border between the gray-blue color of the wall and the bright green color of the apron. The lack of a useful surface in the form of tabletops is compensated by the presence of a large island table, which also serves as a place to rest. Almost neon bar stools carry the accent color of the wall into the room. The gray color of the walls and the frontal surface of the island table perfectly complement the brightness of green. 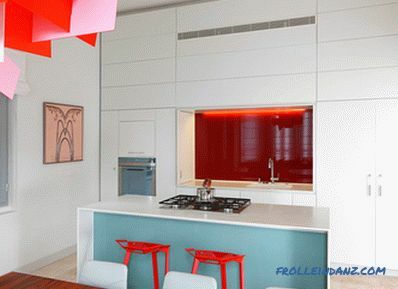 A two-level, illuminated ceiling helps to visually separate the kitchen from the rest of the open-plan space. 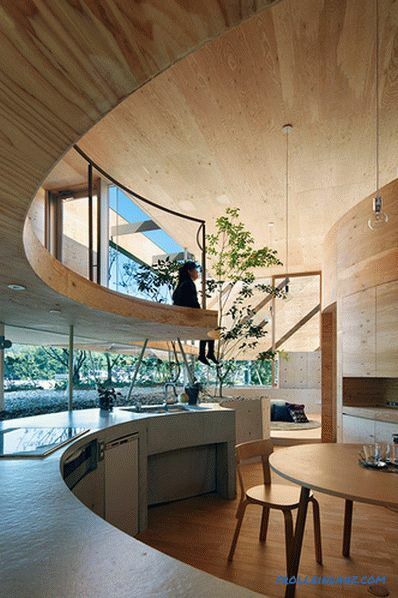 The round shape of this room is designed to provide a sense of security. 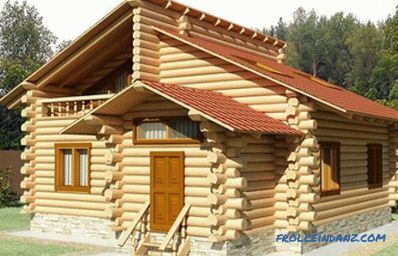 The walls, covered with cedar panels, as if enclose the space in a warm embrace. The bluish-gray countertops are made of painted concrete. The area behind the kitchen counter serves as a huge tub filled with earth and stones, allowing the trees to grow right within the living space. Huge multi-level windows guarantee an abundance of natural light indoors, but you can’t do without simple pendant lights - they will illuminate the space in the evening and at night. 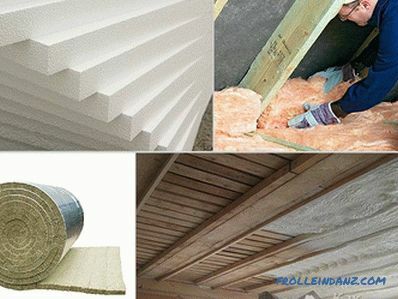 Modern design does not neglect ideas of other styles and materials that have been used for centuries. This interior is one example of how these materials can be combined with modern. A beautiful gray brick wall fills the side wall of the kitchen and flows smoothly into the next living room. 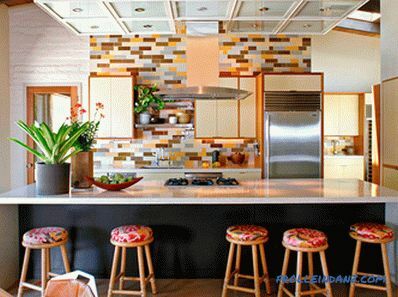 Another wall lined with mosaic resembling a classic red brick brings a warm color to the kitchen. 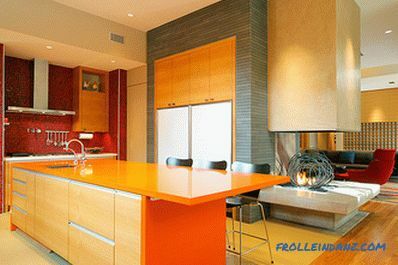 Orange table top on the island kitchen table combines brick red and gray color into a single whole. Red and gray could, when mixed together, become the background, but orange makes all three colors equal participants in the triad. Located on the border of the kitchen and living room, a fireplace with a unique wire sculpture became the final touch of this interior. Smooth, polished surfaces play a large role in modern design, and this kitchen is no exception. From the table-top of the island table made of stainless steel, the view smoothly moves to the same polished front panels of the cabinets. Other surfaces are smooth, but not glossy. Polished to a shine and concrete floors painted in deep brown. 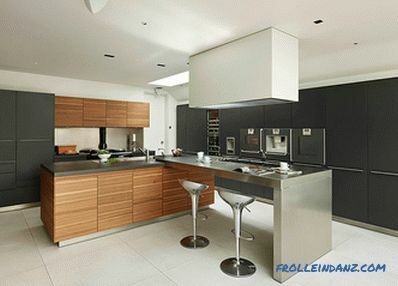 All kitchen appliances were selected very carefully, so that it matches the environment and fits easily into the space. 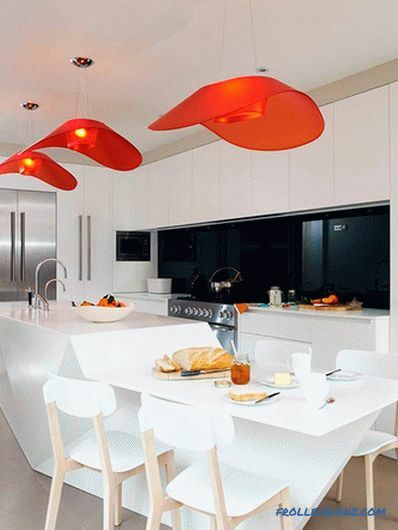 Above the island table, Ombre pendant lights are placed, adding a reddish accent to the interior. Some kitchens just remind us of home comfort, soothing and warm. The designer of this interior has managed to evoke this feeling by mixing vintage styles with modern elements. Brick tiling is a classic element that the designer used to create a modern mosaic of various brown shades on the back wall. Vintage-shaped cabinets are a tribute to the classics, and kitchen appliances and a stainless steel exhaust umbrella add a touch of modernity. Two-level ceiling with integrated lighting combines old and new styles to create a unique look. Bar stools, upholstered in vintage fabric, against the background of an island table made of Corian give rise to a feeling of home comfort. To be modern, the kitchen does not have to be extravagant. Even a small space with the right design can get a modern look. The designer of this kitchen with white walls and white furniture succeeded. The island table with gray granite worktop performs a dual function: it serves as a place for cooking and a place for relaxing and socializing with friends and relatives. The real power of this space comes from the dark green color of one of the cabinets on the back wall. 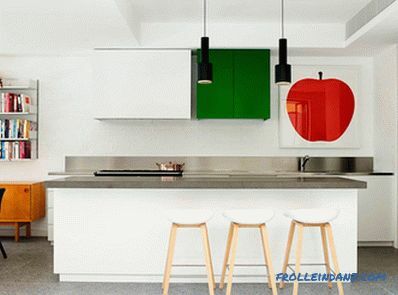 It, in combination with the red image of an apple, provides a sufficient amount of color needed to transform the space from pale and weak to energetic and bold. As you can see, creating a complex design is easy. The grace of the light wood, the solidity of the dark bar counter and the cream lightness of the worktops and apron create an amazing combination in this space. Wooden surfaces are left unpainted, which allowed the ideal structure of the wood from which the cabinets and island table are made, to shine in all its glory. 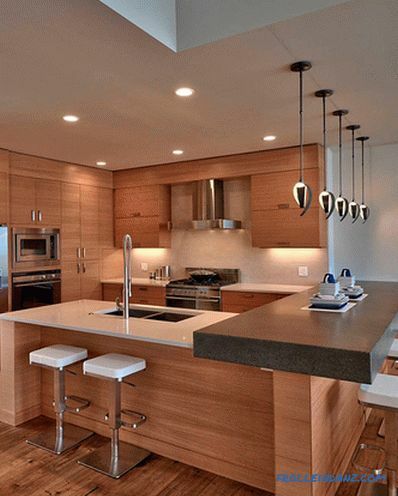 Wooden surfaces themselves can be from any design era, but modern countertops and stainless steel appliances provide a clear indication of modernity. Bar stools and skillful pendant lamps fully comply with the modern style of the interior. Originality is the most common phenomenon in modern design. The wall panels used in this interior guarantee the uniqueness of your design. Here, three-dimensional cubes "jump out" from the wall in random directions. Shiny black cabinets and white countertops allow you to not be distracted from the contemplation of this geometric miracle. Bright orange spots were introduced into the room with hanging lamps and upholstery of one of the chairs, and the golden color of the other chair complemented the palette. 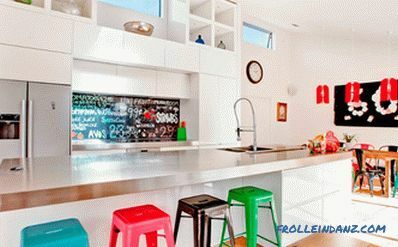 A small kitchen can be difficult to give a decent modern look. To create a modern small space, the designer used two interesting tricks. First, the effective use of space not only guarantees a sufficient amount of storage space for kitchen tools, but also makes the space visually larger. The designer created as many built-in repositories as space allowed him. Extending cabinets to the ceiling itself makes the room look much higher than it really is. Secondly, maintaining a minimum of background tones opens up the room, while using small areas of bright accent colors adds depth to the room without reducing space. 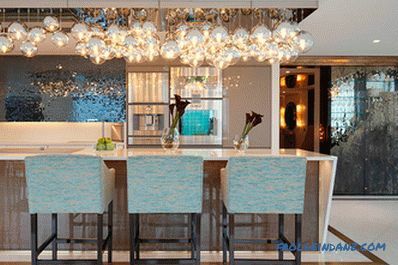 The light blue color on the front of the island table keeps the palette cool. A dark red apron adds an extra dimension to make the room look like it sinks into a wall. 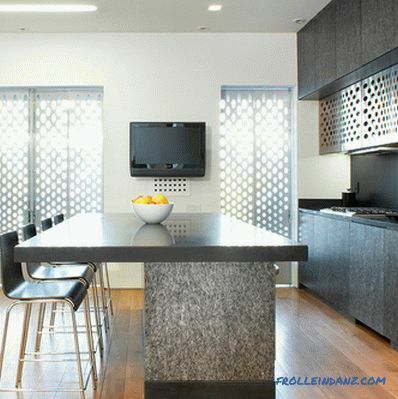 It is rare to find a metal grid in the kitchen, but this interior serves as an example of the fact that, if used correctly, it can make a simple space quite original. As an addition to the light wooden floor, the designers chose dark furniture. All side surfaces of cabinets and island tables are covered with veneer for granite - a typical material for table tops. A rather large company can freely accommodate around a massive table topped with a marble slab. The stainless steel mesh is the front panel of the lower level of the hanging cabinets. The same mesh style is used as window shutters. The combination of materials not commonly used in kitchen design creates a unique look for this space. The black and white elements of this room provide a pleasant background for contrasting jade accents. The design begins with deep black walls. White is opposed to black - white walls of built-in shelves and smooth white floors. Stainless steel kitchen appliances and an emphasis on the island table provide a new design texture. 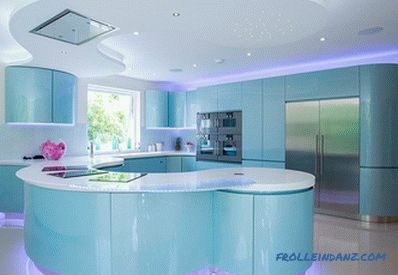 However, the true beauty of this kitchen is jade lights and jade accessories on the shelves. The jade-green acrylic panels that lined the back wall, the hood body, and the front surface of the island table emit a soft green glow, very similar to the fluorescence of antique uranium glass, thanks to the LED backlight.Asian influences are felt in everything here - from the color scheme to the choice of accessories. The tightness and unusual shape of the room can seem like a serious problem when designing a design. To visually enlarge the space, the designer used stainless steel. Its reflective surface provides optical depth and repeatedly reflects light. Often mirrors are used to increase the space, but in this case it is not the best solution. Due to the unusual shape of this room and its unique orientation in space, a highly reflective surface would turn this room into a mirror maze. The brick-shaped tile in the background helps the room look wider, and the dark grout lines separate the back wall from the white side wall. Using a black refrigerator prevents stainless steel from becoming overwhelming. Imitating old planks parquet laid along, creates the illusion of increasing the depth of space. 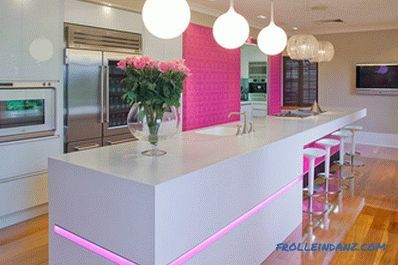 The gorgeous gray color, combined with pink and fuchsia, creates an atmosphere of glamor in this kitchen. As a rule, the space in gray tones seems more manly, but here the glossy coating of furniture fronts adds to the appearance of enough femininity to make the style glamorous. The island table, which otherwise would have been too simple, is accented with pink inlay cutting the gray plane in half, and the exquisite fuchsia-colored wallpapers make the back wall and the frontal surface of the island table stand out. 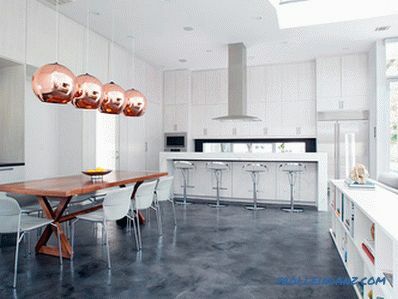 Hard right angles throughout the room are contrasted with round balls of lamps above the table. 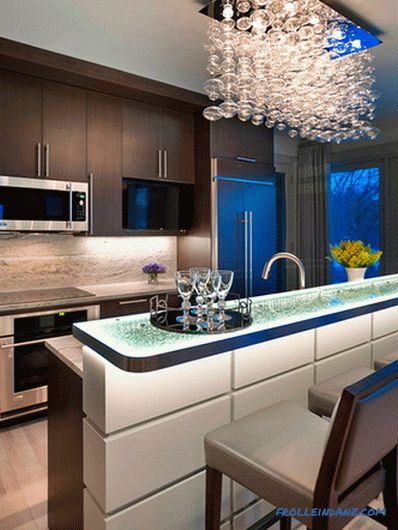 Two crystal mini-chandeliers over the dining area add a touch of elegance and serve as a softer source of lighting. In this space, one can clearly see the inspiration of a great lover of long-distance travel. The curved handles of stainless steel cabinets resemble those fitted to the upper shelves for hand luggage in a luxury airliner, and the shape and acrylic lining of the red wall cabinets evoke memories of a mobile container with which cabin attendants carry food around the cabin. Gorgeous bottom cabinets, trimmed with dark veneer, attract the eye to the floor from the dark gray tiles "under the tree." Illumination of cabinets from the bottom, near the floor, resembles the lights of the runway. The unique wall of the apron, consisting of small rounded convex tiles, is also associated with a gorgeous aircraft. When creating a modern interior, inspiration can come from anywhere, and the idea of ​​a good designer is clear, like a frequent blue sky. The futuristic architecture of this house has become a design element that is used to combine the kitchen and living room in a modern style in a creative form. The color scheme is closely related to minimalist standards. However, in addition to white, stretching through all the space, there are other colors. A large gray shelf, separated from the lower cabinets at a distance of about 15 centimeters, stretches along the entire wall and serves as a table top. Hood and stainless steel kitchen appliances and a black folding lamp extension also break up the white space. The most unique aspect of this interior is the presence of an open room adjacent directly to the kitchen. The floor of this room rises about half the height of the kitchen walls, and to get there, you need to overcome a ladder of several steps. The table top of the dining table is actually a continuation of the floor of this room - the two spaces are combined, while remaining slightly separated. Large windows in the living room provide good lighting for both spaces. 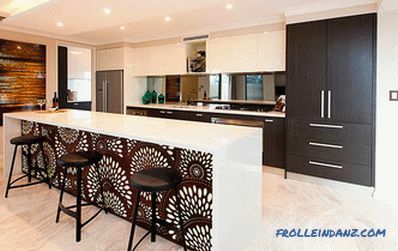 A unique island table is used to separate the kitchen area in this open-plan house. The game of white, chocolate brown and greenish-yellow colors - a nice combination. Large white cabinets provide ample storage space without distracting attention from other design elements. Pale green cabinets and an apron are the perfect complement to the white "neighbors" and countertops. This beautiful green chartreuse is also included in the design of the island table. The true attraction of this interior is a stencilled pattern of chocolate-brown trees on the facade of the island table and on one of the green wall cabinets - a kind of work of art. Most of the light in the room comes from the built-in ceiling lights, as well as lights under the wall cabinets and under the island table, but there are retro-style pendant lights above the dining table. In former times, a black room would not have been approved by apartment and house owners.However, in modern design, black is no longer something out of the ordinary. The dark walls and cabinets in this kitchen help make a large space seem even larger. White storage cabinets along the back wall destroy the darkness of black. Stainless steel roll-up doors in every corner represent an unusual design element that you wouldn’t usually find in home kitchens. The bright red island table is ideal for both cooking and eating. 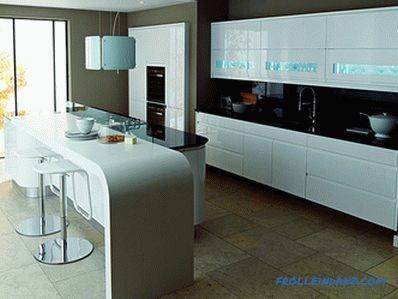 The use of gloss paint on all cabinets, doors and island table creates a fresh, modern look. 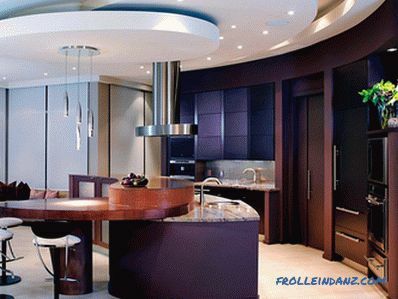 A futuristic fume hood with built-in lighting and a highly artistic chandelier above the island table will provide illumination at both ends of the room. 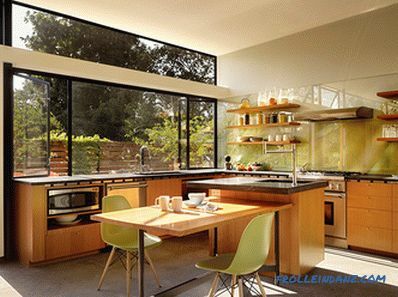 This kitchen with full-length windows is the very embodiment of openness. Instead of hanging cabinets, which can limit the review, the designer chose open shelves. They are placed on the kitchen apron, made of transparent acrylic, allowing you to see the original color of the walls. The island table provides space for cooking, but most of it is reserved for the dining area. Plastic chairs with wooden legs repeat one of the many green shades that are visible through the crystal clear windows. With so much natural light, the designer decided not to be zealous with artificial light and placed only a simple set of track lights in the center of the room. The simplicity of the design of this room does not damage the view from the outside. White walls, cabinets and shelves create a blizzard of beauty in this kitchen combined with the dining room. For a large dining table with a marble top easily accommodates 8 people. Although this table formally separates the kitchen from the dining room, these areas are still one. Four brass luminaires are hung from very high ceilings, providing a sense of solitude at the dinner table. Cubic shelves placed in the dining room provide additional space for the open storage of books and decorative objects, allowing for individualization of space. Painted and polished concrete floors provide the basis for a clean, white winter scene. The built-in white cabinets and shelves that reach the high ceilings of this space make it possible not only to store everything you need, but also to show off numerous designer accessories. An apron made from a board with the name and price of fruits and vegetables, like those used in the market, has become perhaps the most fun and unique design element. In the same bright colors as the text on the apron, painted bar and dining chairs. 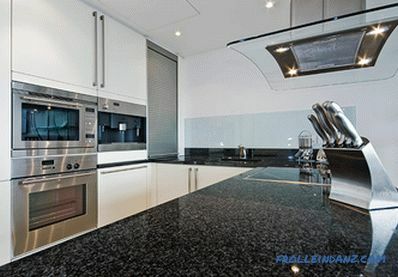 Stainless steel worktops and light pine floors are associated with the market. Black acrylic cabinets and panels, which fill almost the entire wall, give this space a modern sexual mood. Clearly visible here is the contrast of white and black adds sensuality. The light wooden facing of the island table softens the opposition of these two colors and even helps them get along. Zigzag-shaped bar stools reinforce the tempting character of the room. Modern design is omnipotent: a fairly simple space can be significantly improved by adding an equally simple element to it. The bold bright yellow color, appearing here and there in patches on a white background, creates an ideal picture on a seemingly empty canvas. Imagine this space without yellow accents, and you will understand the true role of bright color in the interior. 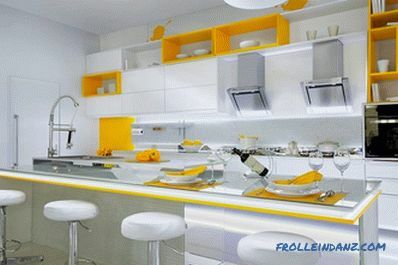 This bold move continues with two funny images of paint splashes above the cabinets; thanks to these yellow blots, design is not taken too seriously. The mirrored tabletop of the island table and modern bar stools serve only to give the space even greater individuality. 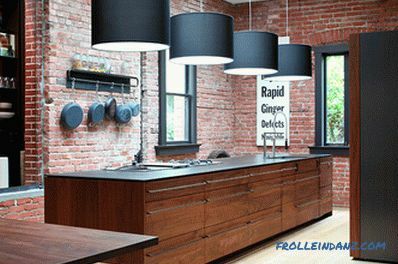 Brick walls are the perfect backdrop for a modern kitchen. This material is perfectly combined with so many colors and textures that it is just difficult for a designer to make a mistake. The dark wood in this kitchen emphasizes the dark red color of the brick, with the result that the classic combination begins to look new. The black color of the table top, the front of the cabinet and other auxiliary elements corresponds to the tone and texture of cast iron. This was done in order to remind you of the days when brick was the most common building material. Looking only at these elements of the interior, it is difficult to determine its true age - it is not clear whether we are looking at some old photo or whether it is a modern design.However, lamps with large black shades leave no doubt that this is a 21st century kitchen. Geometric forms have been used in design for several decades, but then interest in them has subsided somewhat. Today they are back on stage. Simple white cabinets literally transformed thanks to geometric shapes, located in random order. This is a revival of the art deco style of the 1920s, but the bold colors of the time in modern design were slightly muted. Chevron wood flooring adds an element of classic to the interior and draws attention to the large open window at the end of the room. Black cabinets in this space stand out against the white walls. 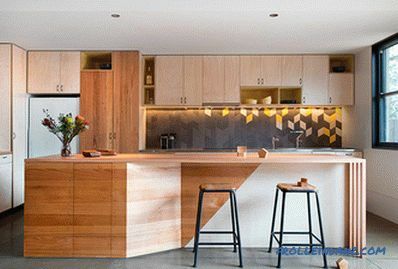 But the most pleasing to the eye here is the design of the wooden cabinet and part of the island table - a sort of mixture of dark and light wood with horizontal orientation of the boards. The second part of the island table, made of stainless steel, together with the bar stools that suit it in style, add a touch of modernity to the atmosphere. A large lamp protruding from the ceiling illuminates the dining area of ​​the island table. 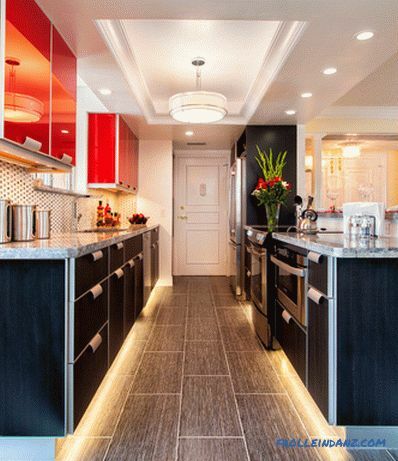 Stainless steel cabinets are lined up in strict order along the walls of this modern kitchen. An island-shaped puddle-shaped table made of the same material acts as a geometric opposition. The unruffled tranquility of this steel miracle is emphasized by the glass worktop. Drops of paint of different shades of blue seem to be frozen inside this "ice". Thanks to the artificially created feeling of coolness, this kitchen looks like an ideal place to relax on a hot summer day. All the splendor of this kitchen comes from the beautiful multi-ton wooden covering of a large island table. Black frosted cabinets, which line up the back of the kitchen, add a touch of modernity to avoid overstrain from the look of wooden panels. On the apron using black and white tile lined diamond pattern. Black and white colors create a modern version of the accent wall that leads deeper into a long, but narrow space. 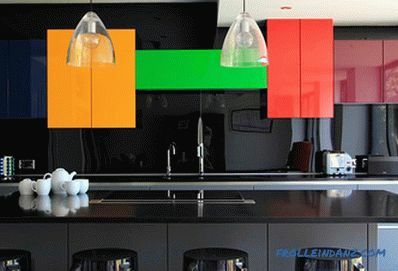 Lighting plays an important role in the design of a modern kitchen. 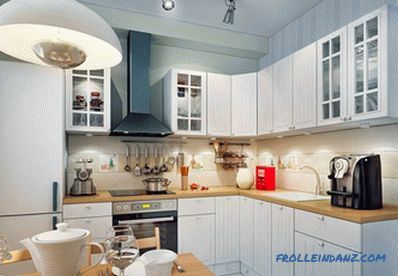 It is the lighting that can turn the most ordinary kitchen into an amazing one. A clear demonstration of this is the interior presented here. 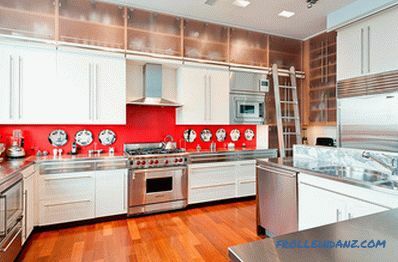 Large, floor to ceiling, stainless steel cabinets cover half the back wall of the kitchen. The remaining part of the wall is assigned to a cream-gray marble apron. The same marble is used for facing the side walls of a large island table. 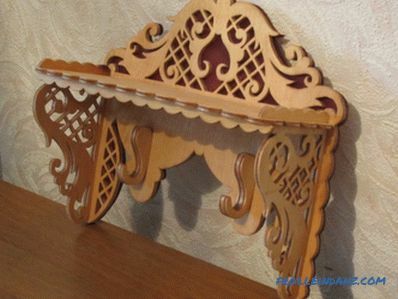 However, the real surprise of this design is the highlight of the front of the island table. 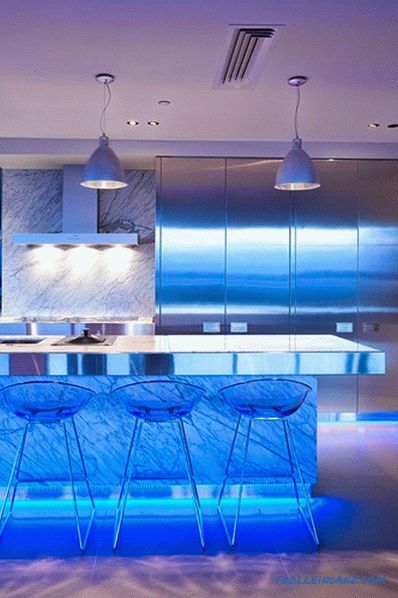 Blue LEDs illuminate the kitchen with a creepy but impressive light. For full effect, the base of the cabinets is also illuminated with the same lamps. The gray-brown walls of this kitchen have some special, dark beauty that seems most expressive against the background of bright white acrylic cabinets. The shiny black countertops opposed to these cabinets and the gray-brown walls are an example of good gradation of tones. 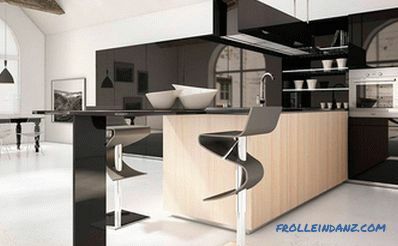 The bar with rounded corners is a separate part of the island table, against the background of its rounded shape, the modern bar stools located nearby look good. These rounded corners are traced in various elements of the interior, including in both parts of the island table and in the lamp above it. Natural stone floor tiles, which are very different from too smooth surfaces, are everywhere present here, adding a texture to the kitchen.